Stimulation of sympathetic nerves causes the release of PGEs. PGEs inhibit adrenergic transmission by depressing responses to the adrenergic transmitter at a postjunctional level. 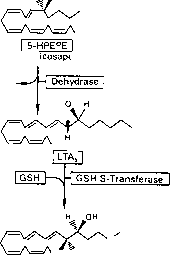 PGEs may also inhibit transmitter release from nerve terminals. Opposite effects are seen with PGFs, which often heighten the responses of effectors to norepinephrine. PGF2„ can facilitate the release of epinephrine from the adrenal medulla.